Each Wednesday at ScrapbooksPlus we've got our Wednesday layout -- instructions for a two-page layout with a free element. I put one together at the beginning of the month, just before we left for California. I used Echo Park's Sweet Summertime collection. Love this paper! And the stickers are so cute. 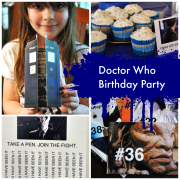 You can switch out the rectangles for photo blocks or place a collage across the page. Add a title. I love this time of year. All the CHA sneaks posted - it gives you something to drool over while I'm poolside with the kids. While I do have some of Tim Holtz's new paper for our August Scrapbooks Plus kit, I'll be waiting not-too-patiently for some of the products I've seen. Pink Paislee - their flower darlings & flair variety pack are just gorgeous! Tim Holtz - his sizzix line of embossing folders, dies, & masks -- a lot of them from his stamps. These Christmas ones are definitely going on my list to Santa! Jenni Bowlin - And speaking of Christmas, love these new chipboard buttons. Maya Road - they have some cute new chipboard books, journaling spots & trims, but I just adore these doilies. Studio Calico - they're coming out with mists, stamps, rub-ons, etc. in addition to their paper. Keeping my fingers crossed that they'll be adding some of these into their monthly kits. Please?! And, tiny alphas. Now Kaisercraft's making them, too. Who hoo! Friday was Rachel's sixth birthday. She was in hog heaven, telling us that she could have anything she wanted because it was her birthday. Well .... not exactly, but who was I to disabuse her of that notion? So I did my best and used pink icing to outline a hand (kinda). And sprayed through a cardboard stencil (note: next time cutting it out from fondant would look better). And added the colored sprinkles and edible gold stars. The she whines, "but I wanted a bunch of people singing Don't Stop Believing!" Hmm. I tell her that her request is just beyond my frosting skills. So she settles for a bunch of pink musical notes. And voila. Not the best looking cake, that's for sure. But enough to please this six-year old. Yup. I'd heard about it but never seen it before. But sure enough at the San Diego Country Fair we found several stands selling chocolate covered bacon and this one. Other items on the menu include the "triple bypass," "the big one," and "flatliner." After ten days of vacation in southern California ... cold, lower 60's Southern California .... chillier than even Nome, Alaska (last Friday) ... we're back. And while I start to comb through the 500+ photos we took on our trip, here's a couple of projects from July's ScrapbooksPlus kit - Bo Bunny. 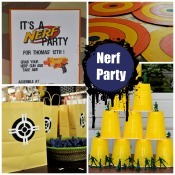 Thomas's birthday party. We had it at Shadowlands, a laser-tag place. I waited outside with several other moms - but it's dark with strobe lights in the game area so I couldn't have gotten photos anyhow. And the party rooms are not ideal for pics either. But I did get some shots of the party guests and Thomas blowing out the candles on his cake. I used smaller photos of the guests, one larger shot of Thomas and a great big chunk of Bo Bunny -- one of my favorite patterns from the line. I ran a few chipboard stars through my cuttlebug using a new Tim Holtz embossing folder. I used the same embossing folder on this layout, on a journaling tag. The paper already had a similar sunburst pattern. I like the effect.